On Thursday, Sept. 20, President Moon Jae-in of Republic of Korea (South Korea) and Chairman Kim Jong-un of Democratic Republic of Korea (North Korea) urged the United States to join talks on declaring an end to the Korean War. While the prospect of a declaration was lauded across the globe, experts expressed doubts if the declaration will actually lead to a nuclear-free Korean Peninsula. The summit marked this year’s third top-level talks between South Korea, North Korea, and the United States. 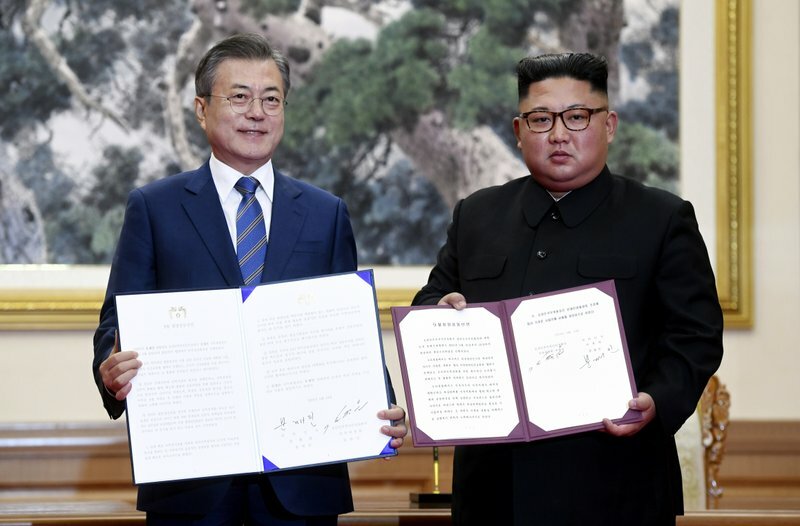 During the summit on Wednesday, Sept. 19, Moon and Kim issued a joint statement that included agreements for bidding jointly for the 2032 Olympics; building more infrastructure to connect the two countries; and permanently opening a family reunion center. On denuclearization of the Korean Peninsula, Chairman Kim did agree to take certain number of concrete steps. Pyongyang said the government will allow international inspectors into the country’s testing facilities and further promised to permanently shut down Yongbyon nuclear complex conditional on reciprocal measures from Washington. Similar promises have been made before, most notably in the Panmunjom summit this past April, where the two leaders met for the first time. Despite the promises from Pyongyang to destroy nuclear facilities, such as Yongbyon, the North Korean regime is estimated by many military and NGO sources to have enough facilities to create nuclear warheads without using the Yongbyon facility. US Secretary of State Mike Pompeo, in response to the joint statement by Moon and Kim, issued a statement on Sept. 19 where he expressed US’s desire to continue talks with Pyongyang on “complete denuclearization of the Korean Peninsula.” The following day, US President Donald Trump acknowledged that he had received a letter from Kim and commented during a short interview that “we have made a tremendous progress” compared to those of his predecessors when “we thought we were going to war.” This is in marked contrast to other US media coverage of President Trump’s sentiments on the Korean dilemma, such as reports in July by the Washington Post over Trump’s frustration in attempting to secure concrete promises from Pyongyang behind closed doors while only communicating what he considers as “progress” through Twitter. Upon returning back to Seoul from North Korea, President Moon told a press conference that Chairman Kim had agreed to his invitation to visit Seoul “in the near future” — which, if followed through, would be the first by a North Korean leader since 1953, when the armistice freezing the Korean War was signed. Furthermore, the North Korean leader had expressed to his South Korean counterpart a desire for a new summit with the United States over denuclearization talks, with President Moon promising to pass along the message personally to President Trump at the start of the 73rd session of the United Nations General Assembly in New York City next week.